Springfield Club (view 1 of 3), located at the southwest corner of Jefferson Avenue and Walnut Street, facing Walnut Street. This black and white photograph is apparently the oldest since the front porch does not extend beyond the front of the house as it does in the second and third views. The third view, which faces the building almost head-on is the newest view, since it shows the building painted in a buff and bright orange trim. 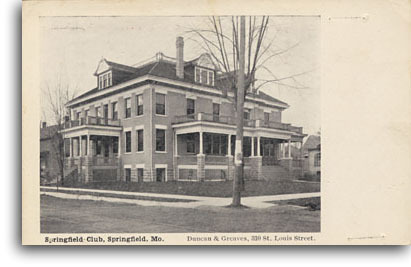 The Springfield Club was organized in 1901. It was originally a social organization but soon became a booster for the city of Springfield. Perhaps the Club's greatest achievement was being instrumental in bringing what is now Southwest Missouri State University to Springfield. It also conducted the campaign to bring the Frisco Shops, the Missouri Pythian Home and the Oberman Manufacturing Company to Springfield. 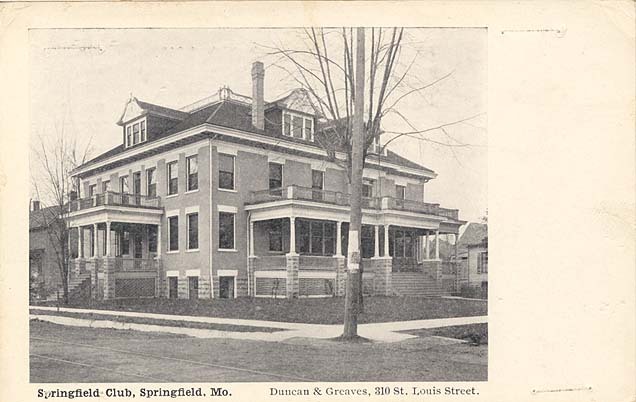 The Springfield Club originally had 100 members, which grew to 150 over the years. The club served luncheons to its members on business days and held dances on the second floor. The club maintained a library, reading room and gymnasium. Dues were originally $25 per year with an admission fee of $100. Charles McCann was the first president of the club. In 1919 the Springfield Chamber of Commerce was created. It was a merger of the Springfield Club, the Young Men's Business Club and three other clubs. The Chamber leased the building from the Springfield Club for three years. Dan M. Nee was elected first president of the Chamber of Commerce. The building was later used for offices and as a radio broadcasting center.